NEWCASTLE has former Novocastrians PURPLENE to thank for next week's SMUDGE gig at the Northern Star. SMUDGE jumped at the opportunity to headline the gig with PURPLENE, on Friday, March 5, to promote SMUDGE'S latest CD REAL MCOY WRONG SINATRA on the HALF A COW label. 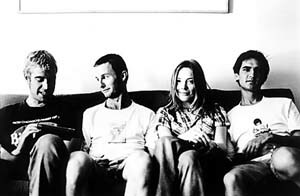 The video for the song HOT POTATO, set at Parramatta speedway, features SMUDGE drummer ALISON GALLOWAY as a fish and chip shop employee and PURPLENE guitarist MATT BLACKMAN in a cameo shot near the end.